The Prince William Cannons came from behind to win this May 1991 game and reliever Brent Gilbert received the benefit, according to The Washington Post. The Cannons pulled ahead in the eighth, with Gilbert as the pitcher of record and he picked up his third win of the campaign, The Post wrote. Gilbert picked up that win in his second professional season. He went on to see time in just one more. He never made AA. Gilbert's career began in 1990, taken by the Yankees in the 19th round of the draft out of Texas A&M. He also played at Blinn College. Gilbert gave up 12 hits in long relief for Blinn in an April 1987 loss. He picked up a win for Texas A&M in an April 1989 outing. 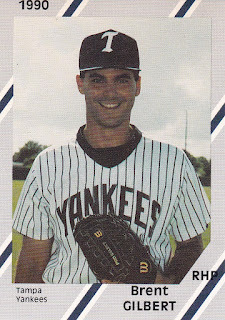 With the Yankees, Gilbert started in the rookie Gulf Coast League. He got into 10 games there, where he picked up two losses and a 3.50 ERA. He also saved two. Gilbert also played in 13 games at high-A Prince William in 1990. He picked up one loss there and had a 3.49 ERA. Gilbert then returned to Prince William for both 1991 and 1992. He got into 31 games, starting nine, in 1991. He went 4-8, with a 4.60 ERA. His 1992 season amounted to only three outings. He gave up seven runs in one of those three outings. He gave up 12 runs in seven innings overall, the final innings of his career.